This weekend, one of my best and most beautiful friends came to visit me from interstate. I love my time with Mandy and without fail, we always include a shopping trip on our 'to-do' list when we're together. 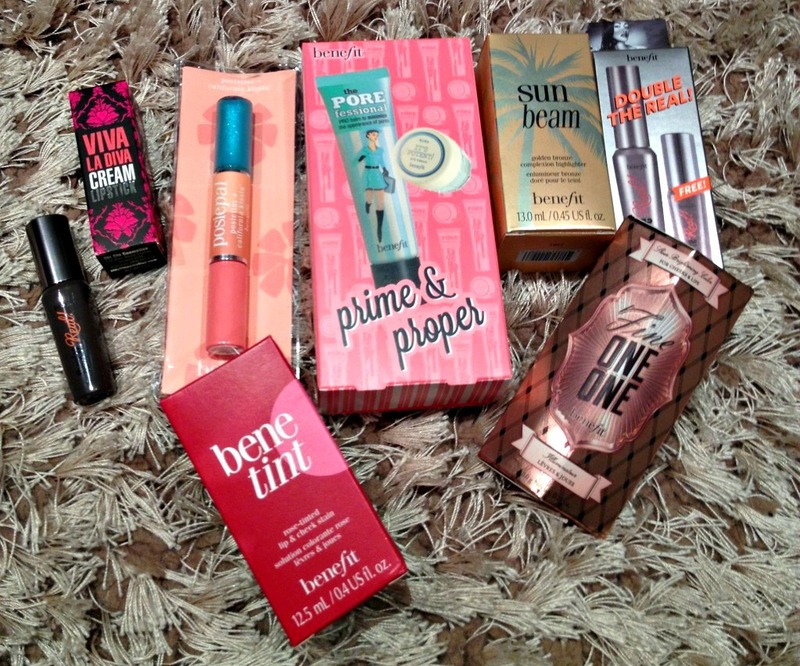 So while we were out makeup shopping, we decided to do a little haul at the Benefit counter. 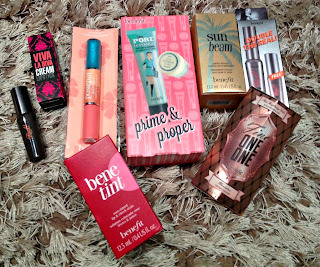 I love Benefit - they have the most amazing products and their staff are always so lovely! Mandy and I would have come home with the whole store if we could have, but unfortunately it wasn't to be. We did pick up a few special things though, so here's what we got between the two of us. The first thing we both ended up purchasing was the POREfessional Pro Balm Primer, which we were lucky enough to pick up in a pack with a sample eye cream as well. It minimizes pores and makes the skin velvety soft and ready for makeup. Makeup really clings to this product and stops it from sliding off, as well as giving a flawless finish. I'm loving this so far and I'm sure I'll end up repurchasing. We also picked up a double pack of the 'They're Real' mascara, which we split. I haven't tried this out yet, but I've heard such great things about it and the brush looks perfect! I can't wait to try it out. The next thing I got was the Benetint Lip & Cheek Stain. I'm a big fan of lip stains, so I was sold on this pretty quickly. It's a great, natural colour and perfect for wearing on it's own or underneath lipstick. It lasts really well and soaks in quickly. I'm really happy with it so far! Mandy purchased a smaller sized version of the stain in a different shade, Posietint. It works the same way as the Benetint, but is a little thicker and a beautiful pink colour. It looks amazing against Mandy's olive skin and came in a double ended tube with a peppermint 'teeth-whitening' lip gloss on the other end. I'm starting to wish I had have picked one up for myself as well! The next thing Mandy got, was the Fine One-One sheer brightening colour for cheeks and lips. The packaging on this is so cute and it's such a beautiful product. It slides on like a blush and highlighter in one, in a creamy type stick. The colour is so pretty on and it's super easy to blend as much or as little as you like. In the way of highlighters, Mandy also got the Sun Beam golden bronze complexion highlighter. This one looks so pretty on darker skin. It just leaves a beautiful gold sheen on the skin and only the tiniest amount is needed. The last thing I got was a Chi Chi lipstick in 'Hot Stuff'. 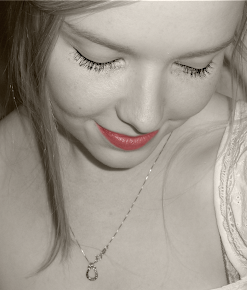 I've been looking for an orange based lipstick for a while and this one is a great colour - not too orange, not too red. It's long lasting and leaves a lovely creamy finish and I'm really enjoying it so far. So there it is - our little BFF haul! I'm in love with my gorgeous new goodies and of course I love my Mandy - hope she comes back soon! PS: Don't forget to check out my previous post featuring a lovely giveaway by Clearasil - all you need to do is comment for your chance to win a beautiful new product! nice post. and great blog love it. would you like us to follow each other will I am actually already following you with GFC. Oh! I love this so much! You are amazing miss Stephy! Lets save up our money and do a repeat in a few months! And we can get matching tattys and be happy forever. And be extremely hot in our Benefit Cosmetics that are blowing my mind!